The Cotswold Wildlife Park spans 160 acres of landscaped gardens, parkland and other facilities located in Oxfordshire, England. 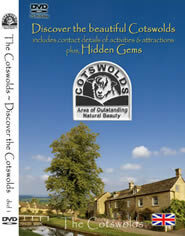 This is definitely one of the must-see sights in Cotswold, itself declared as an Area of Outstanding Natural Beauty. Visitors to the Wildlife Park go wild over the wildlife, so to speak, while also enjoying the beauty of the landscaped gardens dotting the area. The Wildlife Park provides for plenty of activities to observe and interact with the animals. Just remember that animals must never be fed anything by visitors for the sake of safety . Penguins are definitely one of the cutest animals in the Wildlife Park and for good reasons, too. Visitors can observe the staff feeding these proud animals enclosed in the Walled Garden from 11AM to 4PM. Their keepers will gladly answer your questions, too. Lemurs are synonymous with Madagascar so it is not surprising that this is one of the most popular exhibits in the entire Cotswold Wildlife Park. The team of keepers introduces these delightful animals and other species in the exhibit to wide-eyed youngsters and their equally fascinated parents. Of course, the big cats like the lions and leopards of the Wildlife Park are musts for everybody. Although there are no set feeding times, the sight of these powerful felines is a memorable experience in itself. Obviously, it is not advisable to pet the animals in the Wildlife Park unless and until the staff says so. Some hands are better left by their owners’ sides instead of being fodder for animals. The best place to pet the animals is in the Children’s Farmyard. Kids must be supervised by adults before the animals are approached and, hopefully, petted by young hands. Again, visitors are not allowed to feed the animals. The Cotswold Wildlife Park is obviously a park for wildlife and it does not disappoint in the range of animals housed within its facilities. Birds are popular attractions here with Chilean flamingos, owls and other feathered friends hanging out in their spacious aviaries. The primates and small mammals here form an impressive group, too. Laugh at the antics of the Siamangs, the purple-faced Langurs and the Lar gibbons, among others. Don’t forget to see the meerkats, prairie dogs and otters either before going to pay a visit to the reptiles and insects. Indeed, the Cotswold Wildlife Park is the best place to go gaga over wildlife. Admission fees are reasonable and with an experience that mimics a safari, the attractions are well worth every cent. 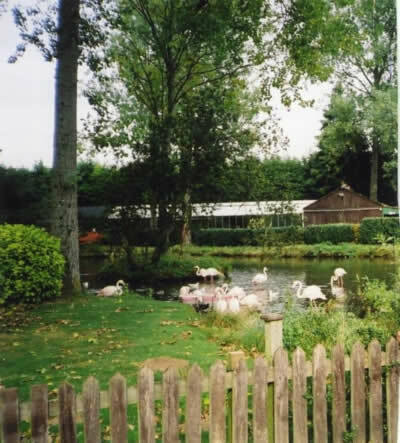 Birdland Park has seven acres of picturesque gardens and is situated in Bourton-on-the-water in the Cotswolds. 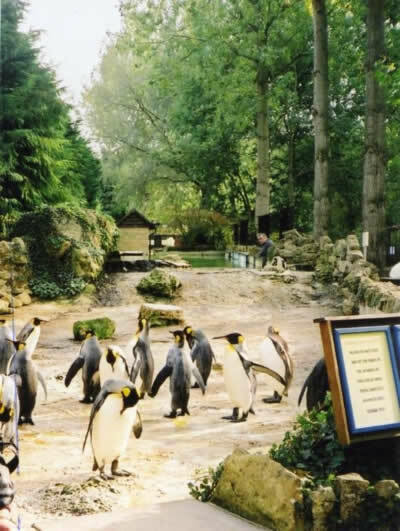 Birdland can boast of having the only group of King penguins in England. It is also home to flamingos, pelicans, cassowary, parrots, falcons, toucans, hornbills and many more. Birdland has expanded to include reptiles,fish and mammals. Meet Diamond, a blue and gold macaw who lives in Birdland with his girlfriend Benji Benji has been flying free for years and never leaves Birdland while Diamond prefers to spend his day in his favourite tree overseeing the day to day running of Birdland. The keepers are very helpful and and they like to involve the children which makes it very special for them.You can even be a keeper for a day. A very special place and well worth a visit.